So much fun seeing the lights with you all last week! It really is worth it to get up early for that run. You may have noticed on our training schedule that we’re repeating a 60 minute run over and over again for 5 straight weeks. There is a method to that madness! We are trying to become very comfortable with an hour long run. Hopefully over the next 5 weeks, an hour long run will not be particularly overwhelming or worrisome. This is a fabulous place to be – being able to go out and run for an hour is empowering…. you’ll feel like Superwoman! The same can be said for the Tuesday run. The schedule has you running 45 minutes every Tuesday until late in January. Believe it or not, that 45 minute run will start to feel like a short jaunt. I’m serious!!! Let’s talk about how to train over the holidays….. For those of you in town and able to join to run together, carry on with the 60 minute Thursday run, a 45 minute Tuesday run, and a 35 minute weekend run. If you are not here, it is ideal to still follow that schedule. However, if you are traveling and are not able to follow the normal schedule, try to run 2-3 times a week for 30-45 minutes. As long as nothing is hurting, the pace could be quicker than we normally do but doesn’t have to be. There is nothing wrong with holding a gentle pace and running only 30-45 minutes. If you are not able to run at all, let one of us know. Depending on your circumstances, we may slightly adjust the first 1-2 runs in January for you. This year, since we will miss 3 Thursdays during break, it is important that you try as hard as you can to keep up your running so you’re ready to hit the ground running (ha ha!) in January. If you’re not here – a little tip that works for me when I need to run on my own: schedule the runs. If you have on your calendar that you will be running for an hour on Wednesday starting at 9 am, you are much more likely to actually get out there and do it. And it will force you to make time for it instead of thinking, “Sometime in the next two days I will go run.” Tell your family when you are going – they will likely pester you about it if they are anything like mine. Make sure you check the weather before making your running appointment with yourself – you don’t want to have it be in the middle of a snowstorm! (Or maybe you do… good excuse to have to skip it??) Past year’s groups have sent each other photos on What’sApp to keep everyone motivated. I think they have had a lot of fun seeing where the group was running, whether on a tropical island, in the snow, or on a treadmill. For Thursday – our first run with no walk breaks. We know you can do it. YOU know you can do it. You have been running for about an hour for the past couple of weeks. And there will be plenty of red men along the way. We will take it nice and easy and before you know it, we will be back at Starbucks. 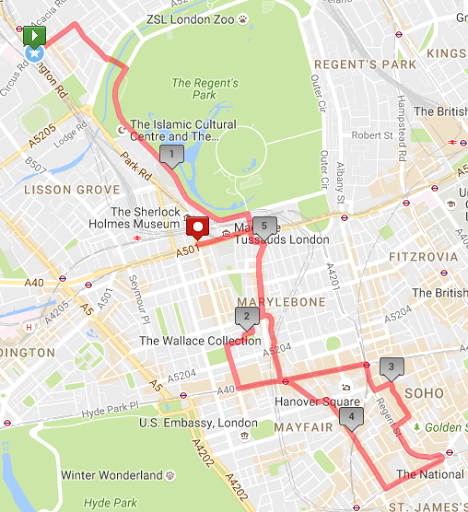 The route: Run down to Hyde Park via Lisson Grove/Seymour entering the park near Speaker’s Corner. The group will exit Hyde Park at Brook St. and run across to Regent St. 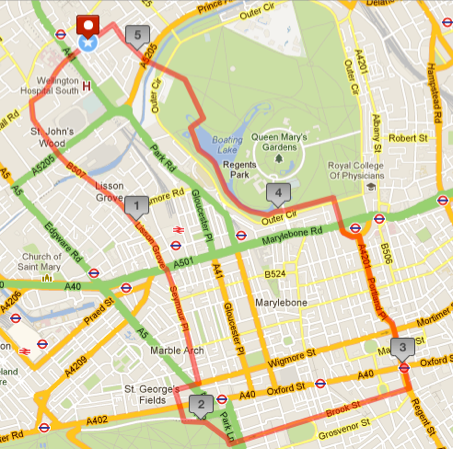 The route turns north to run up to Regents Park then back to Starbucks. Hi,Well, this is it – the week of the Lights run AND your last week of running with a walk break!! Can you believe it? We are so proud of all of you and we are excited to run the shopping district with you when we are the only ones on the street. I know a few of you can’t make it early on Thursday – hopefully you can get together and run. We will miss you! A quick note about pacing. You may have noticed that we were a bit more spread out last week although truly the groups weren’t much different in pace, just a little. We did push the pace a bit for part of the run. We will soon start being a little more formal about this by having people choose to go in the front group or the rear group (although we won’t break it up this week because we will want to stay together for group photos with the lights) and there will be plenty of opportunity for you to try out various paces to see what is most comfortable for you. In addition, there will be some weeks when you’re feeling great and ready to roll and others when you’re not feeling it – it is completely normal to switch around. You are the only one who knows what is right for you. We sent the e-mail with hotel reservation information a couple of weeks ago. Please let us know if you have any trouble with the link or with getting a reservation! If you have made a reservation outside the WRW block, either at the Hilton or elsewhere, please e-mail wrwlondon@gmail.com, so we can include you in our head count. We are going to do the race registration process in January, so don’t worry about that for now (I promise I will nag when the time is right!). For now, just take care of your flight and hotel reservations. Last week, a few of you had a close call with a car on the way into Hyde Park. I just want to reiterate to be extremely careful when crossing streets. It is very easy to just follow your fellow runners into the street and that can be very dangerous. Pay attention not only for yourself but for those around and behind you to make sure you’re not the one doing the leading into traffic 🙂 We are a big group and it is worth the extra time to wait for a signal or a large gap before crossing. This week we will be running two 30 minute segments but there will be many extra stops as we take in the holiday decorations. It will be important not to start out too fast as the first half of the run will have few stops. We will meet at 6 am and plan to start out ASAP so please be on time. In order to make sure we are back to get the kids off to school, we will do a quick warm up, walk to Starbucks/the High Street and then we will start running. When we’re waiting at Barclays and when we walk or run by the houses in town, be VERY QUIET. No talking or only whispers. Our group is very loud and we don’t want to wake up the entire neighbourhood at that early hour! Since it will be so dark, please wear bright or reflective clothing and maybe even carry a bike light or head lamp if you have one. And be extra careful of the cars! The map below is the one used by the MWF group and it has it going to Baker Street. To get home by 7:15, you may need to stop at Bond Street and that is fine. However, we have found the last couple of years that to finish the full 30 minute segments, we need to run to Baker Street. So those of you that can do that, that will be our destination if Bond Street doesn’t do it for us. Please remember your Oyster card! There is still time to give a donation for Starbucks staff if you are so inclined. Micki will give the gift to them next Friday. See you all bright and early on Thursday!